Rome’s Municipal Rose Garden is one of the most romantic gardens in the capital. Located in a peaceful site, its position offers a majestic view of the Circus Maximus and the Palatino. It opens in the months of blooming of the plants (May and June) when the explosion of colors and the smells downright overwhelms the visitors. So if you happen to be in Rome during springtime don’t miss out on this spot that it is out of the ordinary tourist itinerary. An unusual destination that lets you relax, away from the traffic and the oceanic crowds that fill up the rest of the city. Panoramic view from the Rose Garden. Not only roses. 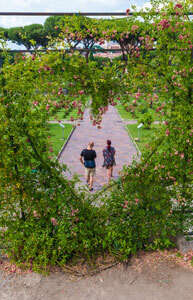 At the municipal Rose Garden you can enjoy a spectacular view. Because of its privileged position on the peak of Aventino, over Circus Maximus, it allows you to enjoy a magnificent view that covers the Palatino, the Santa Maria in Cosmedin Church’s belfry, the top of the Sinagogue, the Vittoriano and the Monte Mario observatory..
A rich collection. 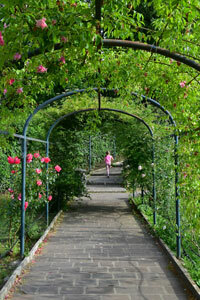 Rome’s Rose Garden features a collection recognised worldwide for its beauty. About 1200 species of botanical roses, old and new, coming from every corner of the planet: from Europe to New Zealand, going through the Far East and South Africa. An explosion of colorful petals and scents. The Rose Garden also features precious 40 million year-old primordial species (the so-called botanical roses). In the “old” section you will find the Damascene roses, that grew between Pompei and Paestum and that still to this date are the main element in numerous essences. 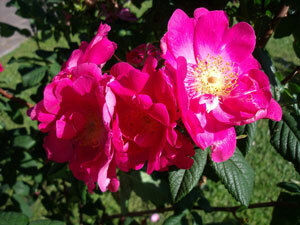 Furthermore the Rose Garden features the Gallic Roses, rare red flowers considered sacred flowers by the Persians. The categorization of the roses. The roses are categorized in three groups that may overlap sometimes: the botanical roses, raw flowers that grow only in the north hemisphere, both in cold and warm areas; the ancient roses, that are a result of the early crossbreeding experimentations back in early 1800; the modern roses, result of the crossbreeding with the roses that the English brough back from China and the Far East along with the shiploads of tea at the end of 1800.. Roses that change color. The most interesting roses of the Rose Garden collection are certainly those that change their color. First off, we find the flower dedicated to the war of Two Roses (named after the crests of the two family that fought for the english throne between 1455 and 1485). This flower is red like the Lancaster crest when it’s in bud and turns white like the York crest when it blooms. Also the Rose Garden features the Mutabilis Rosa, a flower that changes its color seven times in five days: it has a red bud and once it blooms it turnes orange at first, then yellow, amber, light pink, strong pink and finally crimson. The most peculiar roses. The Rose Garden also features unique species of roses: the Omeiensis Pteracantha Lutea, a botanical chinese rose that has thorns shaped like a wing that are red and transparent; the Rosa Chinensis Virdiflora, with green petals; the Rosa Foetida, beautiful but with a bad smell to it. Finally it’s worth mentioning the Peace Rose, a graft obtained in France at the outset of World War II. This rose was used to decorate the tables during the peace negotiations in San Francisco becoming a symbol of peace thereafter. A bit of luck. The blooming time of roses vary. So if you’re lucky you will be able to admire some of them at their blooming best otherwise you will find some already withered. It’s the nature of things. In any event, the municipal Rose Garden allows you to take a walk among colorful and scented plants and a wonderful view on the background. The nearby Garden of Oranges. If you’re into the romantic walk, we recommend you to visit the nearby Garden of Oranges to enjoy one of the most beautiful views of the city. The view from the balcony goes from the St.Peter’s cupola to the meander of Tiber. The entrance is free. The history of the Rose Garden. The ground that hosts the Rose Garden was first destined to flower growing long ago. History tells that Tacito Annales (114-120 a.d.) made reference to a temple dedicated to the goddess Flora that was celebrated in spring at Circus Maximus during Floralia. Up to the XVI century the ground featured vegetable gardens and vineyards until 1645 when it became the Jewish Garden and it featured the cemetery of the jewish comunity. In 1934 the jewish cemetery moved to Verano and the plot of land was then used as a park. It turned into a Rose Garden in 1950 when the one created in 1932 on Colle Oppio by the american countess Mary Gailey Senni was moved to the current area. The jewish stele. At the entrance of the garden a commemorative stele was laid in sign of gratitude to the jewish community that allowed the Rose Garden to be placed in a holy place. Also the alleys that run through the flowerbeds were given the shape of the menorah, the seven-arm candleholder, symbol of the judaism. The international contest. Each year in May the Rose Garden features the Concorso Internazionale Premio Roma, an international contest dedicated to the new species of rose. Crossbreed farmers from all over the world present their “creations” to an international jury. The jury analyzes the course of development of each specie three year in advance if it will take part in the contest in the category climbing roses. Two years in advance if it will take part in the contest in the category bush roses. The award was invented by the Rose Garden creator, the american countess Mary Gailey Senni back in 1933, one year after the growing of the first rose garden in Rome in Colle Oppio. This award is the second oldest award dedicated to roses in the world, trailing only the Bagatelle award, near Paris. It’s a big time event in the botanical industry. Since you’re expected to walk mostly over grass, we recommend comfortable shoes and a hat. And don’t forget a cellphone or a camera of course. Up to date information on opening time and days are available on the official website of the tourist office of Rome. Otherwise you can call 065746810 for information. Both individual access and guided tours are free of charge. Entrance: via di Valle Murcia, 6 and entrance for disabled people in Clivo dei Publicii, 3. Subway: B line, Circo Massimo station. Buses: C3, 80, 81, 160, 628, 715. Railway: Roma Ostiense (connection to subway B line, station Piramide).